Ken Resnick is a veteran broadcaster. 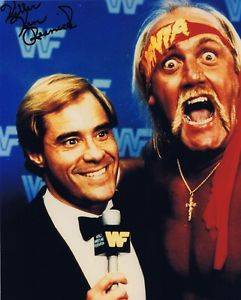 He is remembered for his roles as an interviewer with the AWA, and the WWE during the 1980s. Resnick continued into the ‘90s, lending his credibility to help launch smaller promotions which included the Ladies Professional Wrestling Alliance, the American Wrestling Federation, and Traditional Championship Wrestling. Resnick became inactive years later due to a medical issue. However, the man that Hulk Hogan nicknamed, “Killer Ken”, returned to national television in August 2018 to take up the interviewing position for the Ring Warriors promotion. As an announcer for three decades, Resnick has experienced some significant developments in the art of interviewing, as a result of the changes that occurred in television wrestling in the ‘80s. He discussed some of those events, one of those being the appearance of the American national cable system which gradually overtook locally syndicated television. “The biggest change is that all of the interviews back in the day, when I was with the WWE, were aimed at different specific markets since most of their shows were broadcast on syndication,” Resnick told Ite Lemalu. “With the WWE and other promotions now on national cable, there’s more emphasis on catering to the national audience than to the local audiences”. The accomplished commentator explained the benefits of interviewing under the national format as opposed to the previous strategy, which he thought was time-consuming for his role. “We had days when we would tape anywhere from 50 to 100 promos, doing them for every house show (live event) in every market,” said Resnick. “That’s no longer the case since the monthly pay-per-views and TV shows have overtaken the house show as the dominant source of revenue”. Resnick also recognised the addition of written lines, implemented into WWE programming that the wrestlers must learn by memory. He described that this prevents the talent from giving an authentic performance. In regards to his role with Ring Warriors, Resnick takes the old school approach when conducting interviews. Before interviewing the wrestlers, Resnick uses the opportunity to get familiar with the talent while also utilising his skills to help guide certain wrestlers who are still adjusting to verbally promoting themselves and their matches. Ring Warriors airs on the WGN America network, Saturdays at 8 am ET/PT.